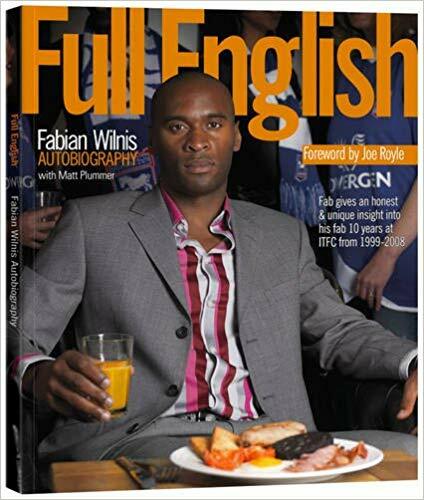 A top-flight adventure and a European foray illuminated his Ipswich Town years, and after a career yielding over 600 appearances, Fabian Wilnis has since returned home to impart the wisdom. England offered much for the popular Dutch defender, as the place in which his on-field life reached its zenith, as well as where it first began to sizzle behind the scenes. Suriname-born and Rotterdam-raised, it was in Suffolk that Fabian Wilnis discovered arguably his true footballing home. It is tough to believe that it was 20 seasons ago when he arrived from De Graafschap to bolster George Burley’s defensive options, with Ipswich pushing to return to the Premiership (as it was still known). They would get there the following year, and £200,000 proved outrageous value for a club stalwart who was along for the ride in teams that entertained and at one point, even astonished in elite company. Although he had enjoyed several seasons as a pro in the Netherlands, which included a promotion with NAC Breda, England opened his eyes to a new way to be – and that’s before we even mention physicality, technique or tactics. “When you prepare yourself for the game in the dressing room, it’s very quiet, but when I came to England it was completely different. The moment the manager had his team talk, afterwards, they put the speakers on and it’s like a nightclub. “Nowadays, it’s normal, but it was something new to me then. I only played with Kieron for one year and then he moved to Newcastle, but he left such an impression while he was there. “Afterwards, I saw him when he came to a lot of games, and he also played against Ipswich as well. So Kieron was the DJ, and also David Johnson, Johno, he was always into his music. They most definitely brought the noise after their arrival back in the Premiership, two-steppin’ their way to 20 wins and 5th position, remarkably just four points behind runners-up Arsenal when the season concluded. Fabian and the likes of Richard Wright, Jamie Clapham, Matt Holland, Martijn Reuser and 19-goal Marcus Stewart (only outscored by Chelsea’s Jimmy Floyd Hasselbaink) sealed a UEFA Cup return for the 1981 winners. 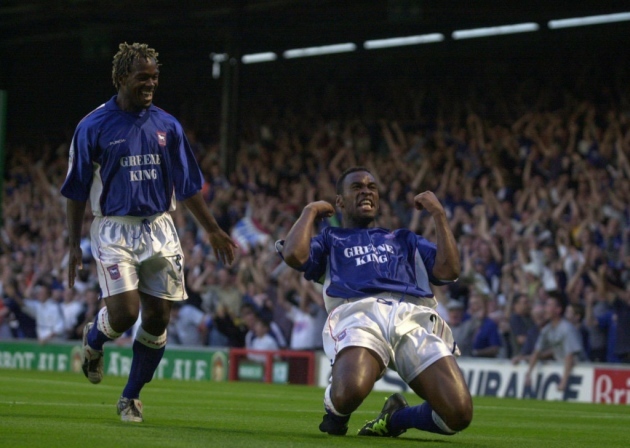 Fabian played 325 times for Ipswich (within which came six goals), with one of those as he came on late for Jermaine Wright in the 2000 Division One play-off final at Wembley. The images of him in the celebrations after the 4-2 victory over Barnsley, with a 73,427-strong crowd under the old Twin Towers, have not faded a jot. There were also East Anglia derbies – Fabian bagged in a 2-0 win at Norwich’s Carrow Road in March 2003 – play-off clashes through various seasons, and there might have been an encounter in there with Manchester United for him to add a scoring touch to. Sometimes, the occasion is such that any extra motivation can send it soaring to dangerous levels! Big match or not, though, for forming that personal cocoon of focus, many players turn to music, and Fabian was one of those. One of hip-hop’s foremost performers and producers took precedence for him, though given the setting, it was more Tract-A-Fella than Roc-A-Fella Records. “I think every player has got his favourite song, either just before the game or driving to the stadium on a match day or whatever. I always used to listen to Jay-Z; it was just so motivating and uplifting. Following in the footsteps of Dutch favourites at Portman Road in Arnold Mühren, Frans Thijssen, and Romeo Zondervan, just like those three, Fabian won the club’s Player of the Year award (2005/06). He recounted his story in the 2009 autobiography Full English (with editor Matt Plummer), and as for the pages currently in production, he is now a coach back home with the Under-19s at non-league side VV Nieuwerkerk, just outside of Rotterdam. He will share later on more of what he has learned since his own playing days, but just as importantly, how have his music choices developed since then? “I do like Drake’s music; it’s mellow, it’s chill, and he’s got his own sort of swag. I’m not really into Dutch artists; I’m more into Dutch DJs. 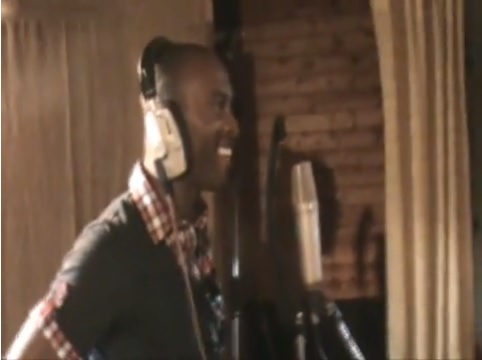 Fabian even featured on a track himself, but it was all in the name of Ipswich Town, on Tractor Boys fan Asa Jennings’ song ‘Let’s Go to Town,’ which also had the input of fellow former Town players like Jason Dozzell and Kevin Beattie back in 2009. There were no lyrics of fury, though, as the ex-pros kept it strictly to a ‘la la la…’, as Fabian recounts. “So I was like ‘yeah, why not?’ I went there with a few of the other players and I must say, that day, it was such a laugh; we were just taking the mickey out of each other, big time. That was all about entering into the spirit of something, with seriousness left at the door, but the connection to music is genuine for Fabian, starting back in his youngest days. Leaving Suriname as a toddler, he lived for a year in Amsterdam before moving to Rotterdam, growing up a matter of metres from Dutch giants Feyenoord’s De Kuip stadium. In his musical arena, it was reggae that first lit the fuse. “I was a big fan of Bob Marley and UB40. My brothers listened a lot to Bob Marley back in the day. A love for the rhythm and live energy has in fact formed a sizeable segment of his leisure time through the years. “Live shows, I’ve been to loads! I’ve been to Drake, Madonna, Michael Jackson, Beyonce, even Destiny’s Child. “I can’t even remember, I’ve been to so many. Festivals as well here in Holland, especially in the summer it’s festival season, so I go with a few mates, or we go to concerts. In the interviews on here, there is one choice that tends to take the crown when the players are asked for any band or performer from all-time who they would choose to see in action. As Fabian just mentioned, however, he was once there for real to see the King of Pop rock the house. 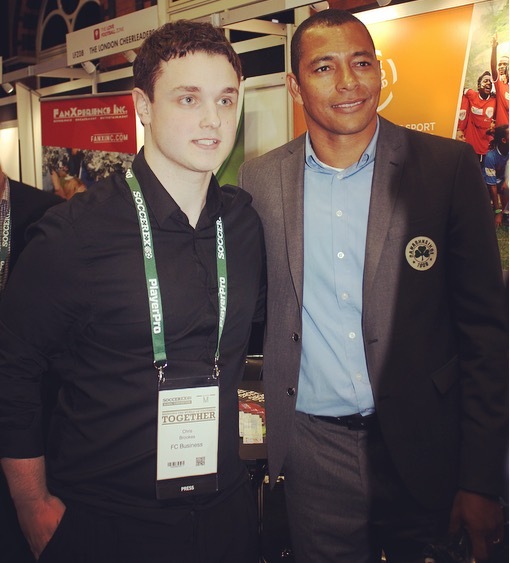 Many legends of the beautiful game have graced the Feijenoord Stadion, and MJ stands right beside them for Fabian. “Oh my God, he was amazing. I went to see him here in my hometown, a long time ago. “The dance moves and everything were amazing, it was just out of this world, and then I had tickets for the 02 Arena in 2009. Then unfortunately he passed away; I think it was eight days before the first concert. Fabian may have willingly lent his voice to Asa Jennings’ aforementioned song, but when it comes to doing it for your initiation in football, there doesn’t tend to be such an element of choice involved! As he recalls, he went for a cover of Don McLean’s old classic that topped the UK charts towards the end of Ipswich’s promotion season of 1999/2000. “It’s more on those nights when the new players have to do it, not during the rest of the season. No one was getting out of it, although a lot of us couldn’t sing. “The song I did was from Madonna – ‘American Pie.’ I just sang the first line and I was hoping everyone would join in so I didn’t have to do it all by myself! Unless you carry some impressive ability, it is best not to take it too seriously in those situations, especially with an all-too-willing army of judges in front of you. If Fabian had to record a song cover with any career teammate, it is a player who lived both the lofty and laborious times at Ipswich with him who would get the call. He is the man with a handspring (and memorably against Bradford City, a stage dive) celebration in his armoury, and has been known to go all out with his Elvis rendition. Fabian explains his choice. “It’s gonna be funny, it’s gonna be crazy, so I would go with Hermann. If it was up to Hermann then it would probably be an Icelandic artist, because he used to listen to his Icelandic songs, and I had never heard of them, apart from Björk. While players will go through plenty of battles alongside their teammates, many say that there are few friends in football. It is heartening therefore to hear that there are plenty who do maintain a bond of brotherhood. Being beside one another in a backline when a team is piling on the pressure is par for the course, but how about in a tiny aircraft, and with one of you controlling it?! Fabian takes up the story as he continues on about his compadre Hreiðarsson. “In the summer holidays, I went to Iceland to visit his home town. I would recommend everyone to go to Iceland because it’s a beautiful country, it really is – don’t go there in the winter! “I went there in the summer, and it’s really funny, because in the summer it’s only one hour dark out of the whole day. We went out to a club, I think it was 1 o’clock in the morning, we went to the club with Hermann, his wife, and my missus, and we came out of the club and it was still light! “I was like ‘oh wow,’ and in the winter, it’s the complete opposite. I went to Reykjavík and I also went to the island where Hermann was born. 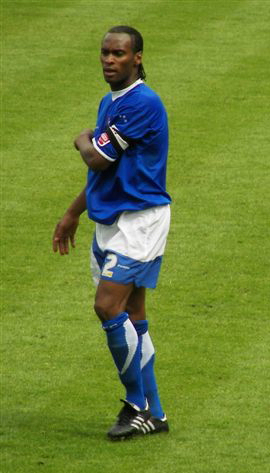 Ex-Charlton Athletic and Portsmouth (amongst others) man Hreiðarsson remained with Ipswich for a season in Division One under Joe Royle, who gave new life to Fabian’s career at the club after he had fallen out of favour, and he would later write the foreword to his aforementioned book. Fabian highlights the former Everton and Manchester City player and boss as the manager who was most adept at getting the best out of him. 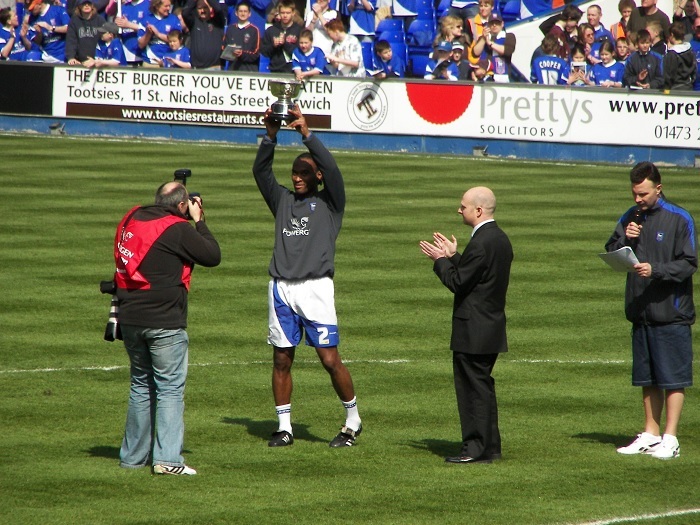 Although they have remained in the second tier for 16 years since relegation, Royle’s tenure brought Ipswich two play-off seasons and included the Tractor Boys reaching and surpassing 80 league goals on multiple occasions, as the likes of Pablo Couñago, Darren Bent and Shefki Kuqi filled their boots, even if they were not always watertight at the back! Fabian hails Royle’s man management in particular, but tells how the preceding times in George Burley’s team were also special, both on and off the pitch. “Our first year in the Premier League, George Burley was the manager, and Marcus Stewart at the time, everything he touched turned to gold. With Marcus, it was so strange, because sometimes you don’t even see him in the game for 89 minutes, and then this one little chance he will get and he will score. “He did that week in, week out, and he was so important for us. You could rely on him; as long as you kept it tight at the back, we’ll get a chance and Marcus will score. “Once a month, we used to go out, with the whole team, even the young guys. We’d go for a fun night, we’d go go-karting, or just out for a drink. “The team spirit was unbelievable and I’d never experienced that before, where the team spirit is that good. I really enjoyed going to the training ground and working to try and get better, try and achieve things, which we did that year. Of course, those days included a goal from a certain Dutch full-back past a World Cup winner on one August 2000 evening when Premiership action returned to Portman Road after five years away. Manchester United were in town, and with just six minutes on the clock and the carnival atmosphere still filling the late-summer Suffolk air, Fabian strode forward down the right, receiving the ball from David Johnson and taking a first touch into the area before drilling home beyond new signing Fabien Barthez. The newcomers held Sir Alex Ferguson’s champions to a 1-1 draw, with a somewhat fortuitous David Beckham free-kick finding its way in, but it was undoubtedly an occasion to savour in a season from the dreamland category. Nevertheless, there is another top-flight goal that sticks in the mind just as much for Fabian. “Yeah, my goal against Manchester United was the kickstart for the season; that we could achieve something that year. That was the second game of the season; the first one we lost 3-1 away against Spurs. “I know I scored a goal but it could have been anyone. That game really gave us the belief that we could achieve something and we were not here to make up the numbers. “That goal was a standout moment, and also my goal against Norwich a few years after. Funnily enough, also in the first season in the Premier League, my goal against Coventry, because it was the most horrible game you could ever imagine. “It was live on Sky and it was just dead boring, hardly any chances, and I think it was one or two minutes from the end of the game. I just burst forward, I don’t know why, I played the ball out wide to Martijn Reuser. Together with the six goals, there were four red cards in Fabian’s near-ten-year stay, though a malicious player or character he never has been. He left his mark as jovial but passionate, and unafraid to air his feelings, which famously didn’t go down all that well with fierce rivals Norwich City once upon a time. On the blue and white side of the ‘Old Farm’ rivalry, they loved him. Fabian told once during his career how he would stock up on the ITFC presents to take back to the rest of his family in the Netherlands whenever he went home in the off-season. Although he has long since retired, coaching in the academy at Colchester United before his current role at VV Nieuwerkerk, he can actually still be found out there in the thick of the action! “I’m still playing for my vets team, for Sparta Rotterdam. We normally play Saturday, but I can’t make it Saturday because I’m also coaching my own team. “It’s a good non-league team and I’m coaching the Under-19s. Whenever I can, I still play on a Saturday, and it’s great because it keeps me in shape and I still love the game. The subject of struggles for players in retirement, with the loss of identity and purpose often felt, has rightly been given great focus in more recent times. It is not the same for everyone, of course, and for Fabian, although his Ipswich career was long and distinguished, he was 28 when he came to England and had already played several Eredivisie seasons. He is grateful to have enjoyed a career as fruitful as he did, which was able to reach its natural conclusion. “It was easy because when I retired from the game I was 38, and then you think ‘enough is enough.’ You had a good time playing at the highest level, and now, next stage in life and developing the youngsters, which is what I’m doing. “I try to bring all my knowledge and experience over to the next generation; sometimes they pick it up straight away, sometimes a bit longer. In the end, they will all become better players. “I’m just grateful to be able to do this; I just get so much joy out of coaching. Don’t get me wrong, my ambition is to still coach and manage a first team, but for now, those 18 and 19-year-old boys, they can be quite challenging. In the early stages of his career, Fabian had a fall-back plan of returning to education to study engineering if football did not work out as he hoped. Pulling up a seemingly permanent seat in the classroom of the beautiful game since, what are the lasting notes he has taken? “You only get out what you put into it. If you don’t put any effort in then it’s 100 percent sure you won’t get anything. “Before I came to the UK, I saw football as a hobby, but I was 27 and that was the first time I saw it as a job. You have to look after yourself, you have to rest properly, eat well and all this sort of stuff. “Before, I was like ‘oh I’m still young, I don’t have to worry about a thing.’ I became so much more professional when I came to the UK. “You have to invest in yourself and then you’ll see the benefits. That’s the thing I’ve learned and it’s the advice I give to the youngsters and anyone who wants to become a professional player. “Yes, you have to, even if you have to go for a run all by yourself, in the rain, in the snow. You will see the benefits, because there’s so much competition and if you’re not fit enough, not strong enough, not lean enough, then the manager will pick someone else, and that’s the pure fact. The good news for Fabian is that he will need no time to get himself up to speed for this closing scenario. Through the years on Beats & Rhymes FC, players from all over have been asked to imagine themselves in the heat of the 5-a-side action, with any four teammates from their career eligible to fill their line-up alongside them. Fittingly, Fabian’s selection has a very strong Ipswich theme, with plenty of personality, and some additional match-winning Dutch class (just in case Fabian’s goal touch deserts him…). The last word goes to an Ipswich great who passed away in September at 64 years old. “I would say Hermann (Hreiðarsson), because Hermann is a great guy, a fun guy on and off the field. Also, a winner. “Pierre van Hooijdonk – I played with Pierre at NAC Breda. He’s so clinical in front of goal. “Kieron Dyer in midfield. I would say Kelvin Davis in goal. “Kelvin, he’s like a proper comedian; he comes up with certain things and you can always hear him before you see him. He’s that kind of character but also a great goalie. “I could choose Wrighty (Richard Wright) or Kelvin. Wrighty did well in the Premier League but I still pick Kelvin.